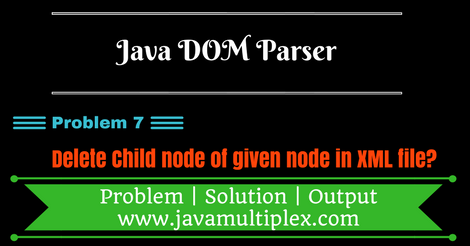 How to delete child node of given node in XML file using DOM Parser in Java? 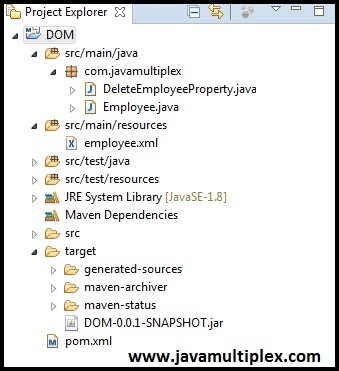 Home DOM Parser How to delete child node of given node in XML file using DOM Parser in Java? Here requirement is to delete child node <age>34</age> for Employee whose id is 3. Similarly user can delete any child node for any Employee. 2) Enter node id, child name. Here node means Employee and child means property of Employee. 4) Now one by one examine each child node Employee. Get its id as follows. Compare this id with id of given Employee. If id found then check whether given child node exists or not. If child node exists then get previous sibling of child node as follows. If sibling is text node then delete it from given node Employee. Now delete selected child node from given node Employee. Here you can see that child node <age>20</age> has been deleted for Employee whose id is 2.